A masterful summary of genetic science past, present, and future, from one of its prime movers. Watson (Father to Son: Truth, Reason, and Decency, 2014, etc. )—who, along with Francis Crick and Rosalind Franklin launched a revolution in biology with their 1953 publication of the double helix structure of DNA—reviews all that has happened since his own earlier accounts, including The Double Helix (1968) and the original version of this book (2003). As the author approaches 90, he chronicles the history of the field, with the assistance of Berry (Evolutionary Biology/Harvard Univ.) and Davies (The $1,000 Genome: The Revolution in DNA Sequencing and the New Era of Personalized Medicine, 2010, etc.). 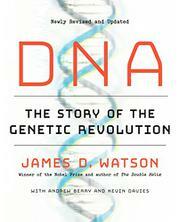 The chapters about the race to discover the structure of DNA capture the excitement of that time, but Watson returns to a critical stance as he recalls how alarmist fears about the dangers of recombinant DNA, which made it possible to incorporate foreign DNA into an organism, curbed research in the 1970s. He also condemns those who would ban genetically modified organisms, and he marshals strong evidence in support of GMOs. A major chapter details the Human Genome Project, which begat yet another race, this time between the government and private enterprise. To a large extent, the fallout of that initiative has fueled advances—which Watson summarizes in later chapters—in forensics (DNA fingerprinting) and medicine (the discovery of disease genes and new approaches to cancer treatments). For each application, the author provides guidebooklike details of methods and examples. Now, with the cost of human genome sequencing plunging, huge databases of genomes can be analyzed, with prospects of precision treatments and discoveries of the causes of complex diseases like mental illness and even analyses of behavioral traits. There is no question that in weighing nature vs. nurture, Watson sides with nature. He would use new gene-editing techniques to correct genetic defects in somatic cells and would have no qualms about considering enhancing future generations by editing germline cells (eggs and sperm). In this bible of DNA information, Watson is as provocative and optimistic as ever.